We have the sad duty of sharing the news of the passing of Prof. Franz Gerstenbrand. Franz Gerstenbrand was born in 1924 in Hof (Moravia, Czech Republic). 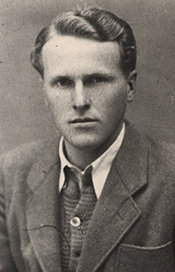 He completed his medical training in only four years under difficult post-war circumstances in Vienna. His specialty training was at the Psychiatric-Neurological University Department of Vienna University Hospital (Psychiatrisch-Neurologische Universitäts-Klinik Wien), chaired by Prof. Hans Hoff. As a pupil of Prof. Hoff, Prof. Gerstenbrand had great interest in traumatic brain injury and was the first to initiate a unit for traumatic brain injury treatment in Vienna. He also had a keen interest in child neurology. In 1967, Prof. Gerstenbrand published his habilitation treatise on traumatic apallic syndrome, Das Traumatische Apallische Syndrom. This book for many years was regarded as standard literature on traumatic vegetative state in German-speaking countries, and it made him well known in Central Europe. Franz Gerstenbrand months before becoming a medical student in Vienna. Prof. Gerstenbrand was appointed in 1976 as first chair to the University Clinic for Neurology in Innsbruck. 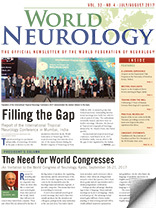 He quickly recognized the upcoming needs and advantages of subspecialities within neurology. In the following 18 years, he helped initiate numerous subspecialities, including neurointensive care, neuroimaging, and caring and advocating for stroke patients. All of those initiatives were innovative in the second half of the 1970s. His decisions laid the foundation for the outstanding reputation of the University Clinic for Neurology in Innsbruck. He was an active clinical researcher, publishing more than 780 papers. He also co-edited 12 textbooks and monographs. 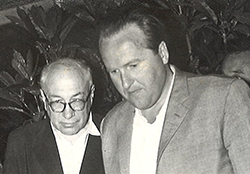 Prof. Gerstenbrand was involved in many international collaborations, including one with the Institute for Biomedical Problems, Moscow, which led to the first Austrian-Russian space neurology collaboration. His team developed a series of experiments that were performed by a number of cosmonauts, including the first and only Austrian cosmonaut, Franz Viehböck. In 1962, he initiated the Danube Symposium — a clear-sighted decision to bring together East and West European neurology. His strong belief was that Central and Eastern European neurology needed to be represented with a single voice. The Danube Symposia are still held each year. 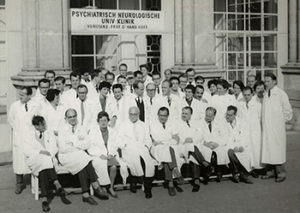 Dr. Gerstenbrand (second row on the far left) at the Psychiatric-Neurologic University Clinic. Throughout his life, Prof. Gerstenbrand advocated networking and collaboration within neurology. In 1991, immediately after the fall of the Iron Curtain, his strong advocacy and initiatives resulted in the foundation of the European Federation of Neurological Societies (EFNS), and he served as its first president. Those efforts were supported by Lord Walton, who at that time served as WFN president. EFNS was exceptionally successful, bringing together neurologists from all European countries. Part of the success was his strong belief that all European countries should have access and equal status in the organization. The EFNS was followed by the European Academy of Neurology. As specialist with his teacher, Prof. Hans Hoff. Until recently, his thoughts and efforts were directed in supporting areas of the world that lacked neurologists, and where training was needed. His last efforts were directed in supporting areas in Asia and Africa. For many decades, he had strong cooperation with Myanmar. Only days after his funeral, colleagues from Austria traveled to Myanmar to teach an initiative he was arranging in his last weeks. As he had foreseen many neurology developments, Prof. Gerstenbrand had foreseen his own death. In his last weeks, he made arrangements for his funeral and bought a grave at the same cemetery near the grave of Hans Hoff, his admired teacher. Prof. Gerstenbrand has received numerous awards, including honorary doctorates from Charles University in Prague and Aristotle University of Thessaloniki, the Valeriy Gagarin Medal of the Russian space organization, and several of the most prestigious medals in Austria. His life was dedicated to advocating neurology, and many of his pupils have been successful clinicians, leaders, and advocates. Prof. Gerstenbrand was a model for generations of neurologists in Central Europe. We express our condolences to his wife Gudrun, his children, and his grandchildren.